We are constantly testing our products to fully understand and characterize them, and this is important both for ourselves and for our customers. A test method will usually produce results in a timely fashion, but there are times we must use an accelerated test method so we can get the results before we take that last lonely boat ride across the river Styx. This article describes some of the accelerated testing we do here. WEST SYSTEM® epoxy is often used to provide a moisture barrier for applications that are in frequent or constant contact with water. In order to know how effective our epoxy is at resisting moisture, we have to be able to measure how much water it will absorb. It would seem logical to most folks that all we need to do is place a coupon or cylinder of epoxy in some water and measure the weight gain over time and, in fact, this is what we tried at first. We learned that the epoxy absorbs water so slowly at room temperature that it would take forever to reach equilibrium (the point of maximum water absorption). Heated water would speed the process up and we settled on 140°F (60°C) as the test temperature because this is approximately the glass transition temperature (Tg)—the temperature at which the epoxy begins a transition from a glassy solid to a rubbery solid. At this transition point, the epoxy “relaxes” a bit on a chemical level, and this relaxation of the cross-linked epoxy matrix allows for accelerated water absorption. At the heated water temperature, we could get results in a reasonable time period. First, we cast cylinders of epoxy in a plastic syringe body that is ½” in diameter and spin the cylinders in a centrifuge to remove any bubbles. After the epoxy has cured for 2 weeks at room temperature, the cured cylinder is removed and sanded down to about 1½” long. 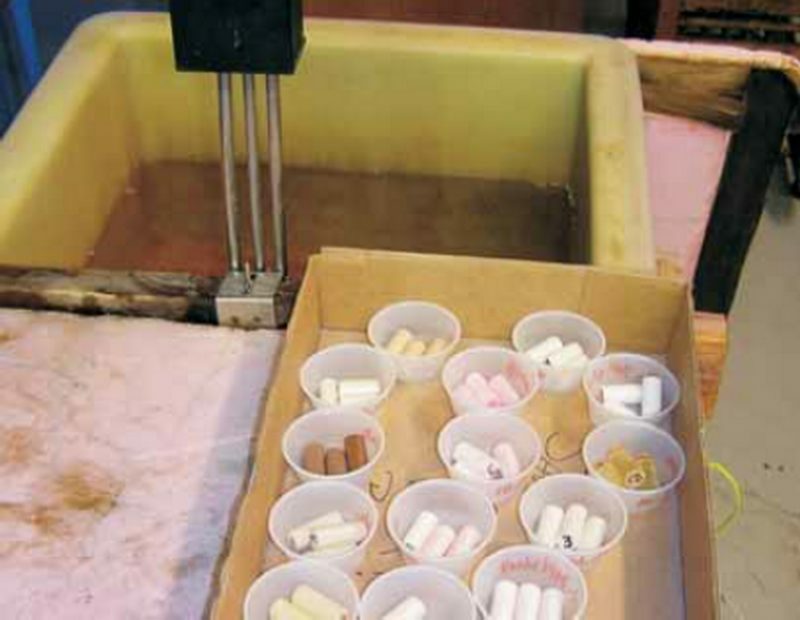 An initial weight is then recorded, and the samples are placed in a water bath that maintains a 140°F temperature. The test is designed to run over a 3-week period with measurements of weight gain taken at 1, 2, and 3 days and 1, 2, and 3 weeks. By taking the measurements this way, we can establish a relative rate of water absorption and point of equilibrium. Because this is not an ASTM-recognized test procedure, the data has been traditionally viewed as a comparative tool by our chemists, valuable for formulation purposes but not something we publish in our physical properties literature. That said, a two-part study entitled “A 15-year Study of the Effective Use of Permeation Barriers in Marine Composites to Prevent Corrosion and Blistering,” first published by the Interplastic Corporation Thermoset Resins Division in 2002, supports accelerated testing as having a correlation to real time testing that has practical application for making formulation and screening decisions. For a copy of the report, contact Interplastic Corporation. In order to gain a complete understanding of the moisture resistance properties of our epoxy systems, we use another accelerated test that measures the moisture exclusion of a film of epoxy. That test is described in the Epoxyworks 25, Moisture Exclusion Effectiveness. This entry was posted in Epoxy Products, Materials Testing, Techniques & Tips and tagged 24, accelerated testing, Bruce Niederer, Epoxyworks #24, Fall 2006 on February 4, 2015 by ewadmin.